Trijicon Accupower 1-8 vs. Vortex Razor in 2019 - What's The Difference! This is not my first comparative article between a Trijicon product and a Vortex one. Vortex is the upstart brand that’s coming to disrupt the older brands with a budget-friendly model to compete against every market category around. Sometimes it works, sometimes it doesn’t. In this article, I review two similarly priced models, where the Trijicon is around 30% more expensive than the Vortex! Let’s take a closer look at both models and decide if the performance is equal to or better than the price difference. 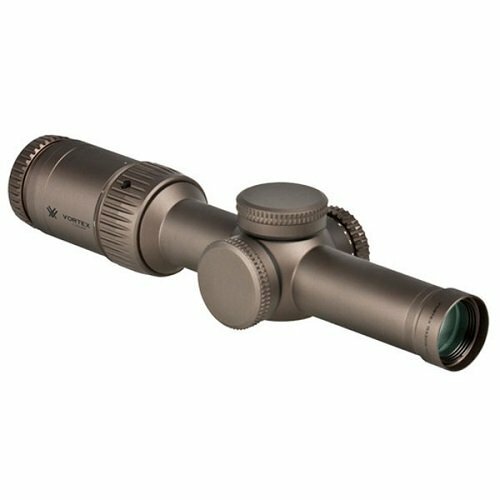 This Vortex Razor is their GEN II 1-6X24 model and comes with some exciting features. Among these outstanding features are the versatile and perfect AR platform scope design for short to medium-range tactical applications. This Vortex model comes with their highest level of optics, and these include the apochromatic objective lens system (APO) that integrates index-matched lenses to correct color across the entire visual spectrum. The lenses are made using Premium HD (High Density) extra-low dispersion glass and are coated with XR™Plus a Fully Multi-Coat solution that delivers the highest level of light transmission with multiple anti-reflective coatings on all air-to-glass surfaces. These coatings are applied using the cutting edge technology of Plasma spattering. This model also comes with a Second Focal Plane Reticle giving you the same ideally-sized appearance combined with their locking Illuminated Center Dot that Locks the illumination at any setting. 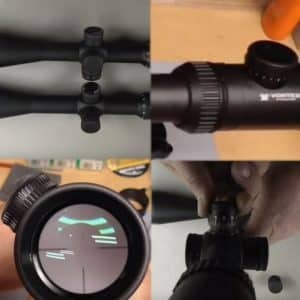 The JM-1 BDC Reticle is a simple and intuitive design unique to Vortex and created by the Jerry Miculek, a world-renowned competitive shooter, instructor and gunsmith. 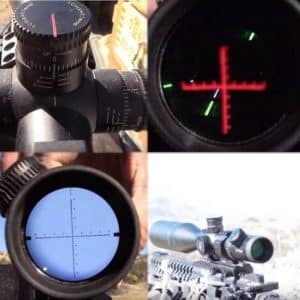 This reticle delivers you a rapid, accurate target acquisition from point blank to 600 yards, and comes with 11 illumination settings for perfect daytime clarity. The housing is made from a rugged aluminum alloy, machined to perfection and hard anodized to provide a matte anti-glare finish. The inner tube is sealed using O-rings for waterproofing and is Argon gas purged for anti-fogging properties. All in all, a rugged, shockproof, waterproof and fog proof body. The Trijicon 1-8×28 AccuPower® is one of the most versatile riflescopes on the market and is designed for competitive, tactical, and sporting applications. The Trijicon is made using all the best materials that Trijicon provides in all their models, and this is no exception to that rule of production. The hard anodized aluminum body is a wider 34 mm and provides a rugged and durable housing that is nitrogen purged for fog proofing and comes with O-ring seals to provide a watertight construction. , a superior shockproof, waterproof and fog proof design. 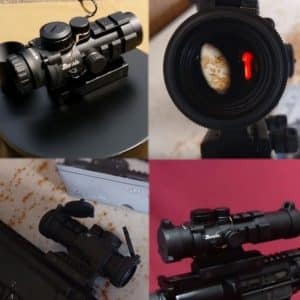 This model comes with a red or green universal segmented circle/MOA reticle and comes with a CR2032 battery to manage 11 illumination control setting. The 28mm objective is very easy on the eye and delivers exceptional quality of performance, especially with the high-quality optics that Trijicon always uses (hence the price). The 1-8×28 model is the newest in Trijicon’s AccuPower line of scopes and comes with some extra adjustment corrections that make it an easy scope to adjust and set without the use of special tools. The first focal plane reticle is a segmented circle that came to fame in Trijicon’s VCOG. This power and size of the Accupower 1-8x works with any caliber and is most suitable for .308 rifles. The Trijicon model is one of their latest releases and has come after years of experience in design and fabrication of rifle scopes. Against this comes the relatively new Vortex Razor, also a young model, but from a much younger company too. 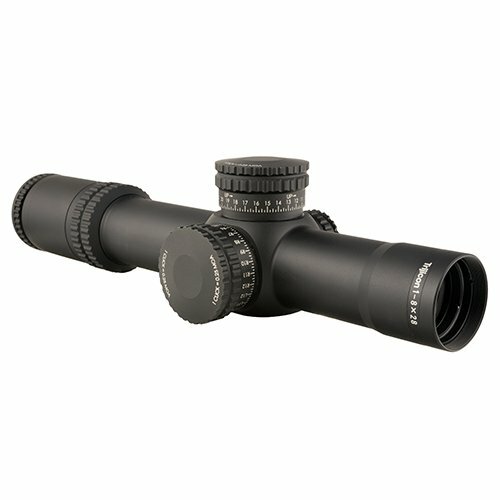 The Accupower is an FFP scope; this means that its first focal plane retains the subtensions and the drops remain the same at any magnification. The Razor is an SFP model, so you compete with two trains of thought, and there are those that prefer one to the other, and some that can work with both. So this is a tie. In terms of weight, there is not much difference, at 25 ounces, the extra 0.2 ounces on the Vortex are meaningless, and as such, the weight issue is a tie. However in terms of length, the Vortex is 0.7 inches shorter, so this is slightly in favor of the Vortex for overall dimensions. (I am nitpicking here). The body of both devices is aluminum, but the Trijicon is forged and machined where the Razor is die-cast. The difference is that forged metal has a higher density and as such is both harder and more rugged than die-cast. When it comes to objective lens diameter and overall brightness controls, the Trijicon has better overall performance. The Trijicon give you 11 brightness settings, and you can dial in any level and lock it into place if you want. The Razor also has 11 brightness levels, and they are comparable to the Trijicon, so in terms of brightness, they both deliver similar performance. A tie. What the Vortex Razor does bring to the table is fast target acquisition, and as a top of the line model for Vortex, dares to take on the big boys of Trijicon. However, the objective lens is smaller, and the body is also smaller, only 30mm compares to the Trijicon 34mm. What the razor does give you is an impressive eye relief, similar to the Trijicon and when the magnification is set to 1, you get very fast and very accurate target acquisition, which is equal on both. The reticle on the Razor is SFP, some complain that this should be an FFP, but there you are. In terms of optics, Vortex has spared no expenses in providing their top level glass and coatings, as such, in this case, it performs as well as the Trijicon for clarity and vision, and delivers all the necessary indexes and corrections that you would expect from a top-level scope. As for the Accupower, the name speaks for itself, and there is no need to discuss the optics of a Trijicon, they are one of the best on the market. This Trijicon model is a heavy model, and it is not as tough as the Trijicon VCOG, but for a grand less, this model together with its first focal plane reticle with 11 power settings, the Accupower 1-8 is an exceptionally accurate and rugged model. This is an expensive model, even for Vortex, which means they dedicated their production line to higher quality materials and produced a mean scoping machine that performs as well as any other in its category, but for a much lighter touch on your purse. The Trijicon Accupower is an amazing scope, no two ways about this. It delivers everything you expect from a Trijicon model, it’s rugged, well balanced, slightly heavy, but performs perfectly in every condition. Against this, you have the Trijicon Razor 1-6 that delivers very similar performance levels, and in fact is just as fast and accurate in target acquisition when comparing the two. The bottom line is this; price wise, the Trijicon does not deliver substantially more than the Vortex, and that’s why the Vortex wins hands down in this comparison. Price to performance is just much better in favor of the Vortex. Next PostVortex Diamondback vs. Diamondback HP: How to Choose The Best?